Yes Bart, what Ed said. A couple more thoughts. 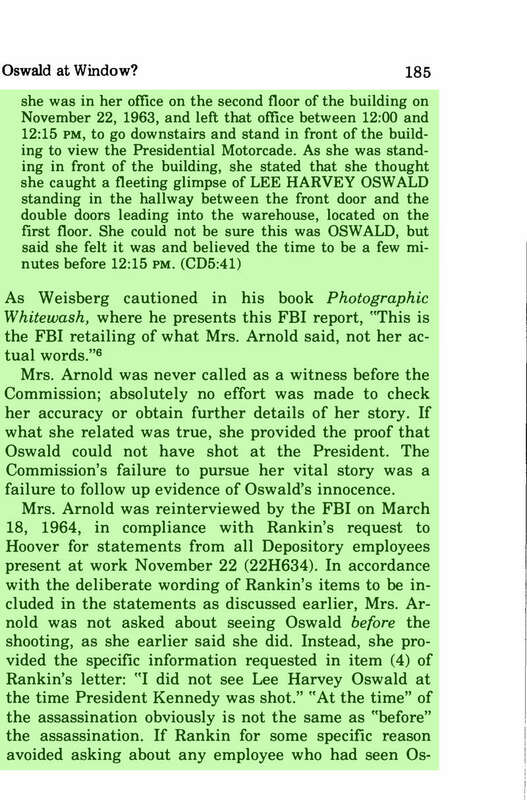 One is that the FBI placing her outside looking through the glass at Oswald inside was the only way to make her identification of him tenuous. It was really the only way to do so. Interesting that they felt comfortable having it happen on the first floor level. Had she actually stated she saw him inside, in the DR, on the first floor? 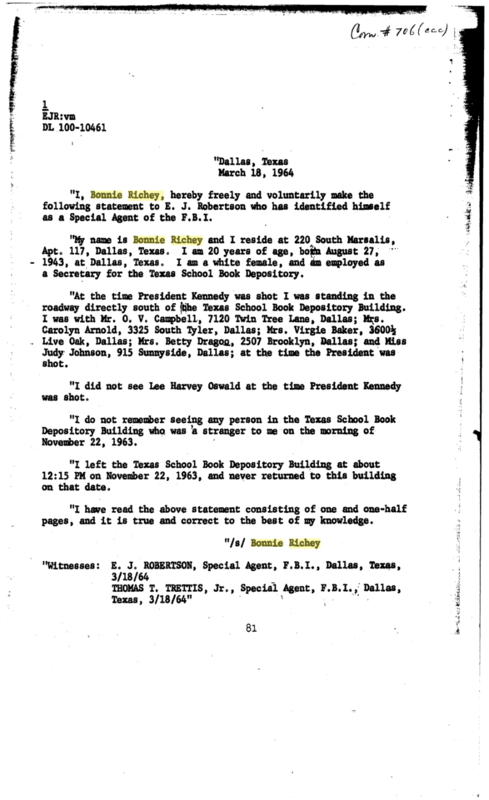 Second is simply that she could have had her drink of water at the fountain on the second, gone past an empty second floor lunch room on her way to the back stairs down to first floor, walked out, seen Oswald in the Domino Room "at the booth on the right", and gone on out the front. Years later she could have recollected differently and put him on the second floor for several possible reasons; memory or motivation. 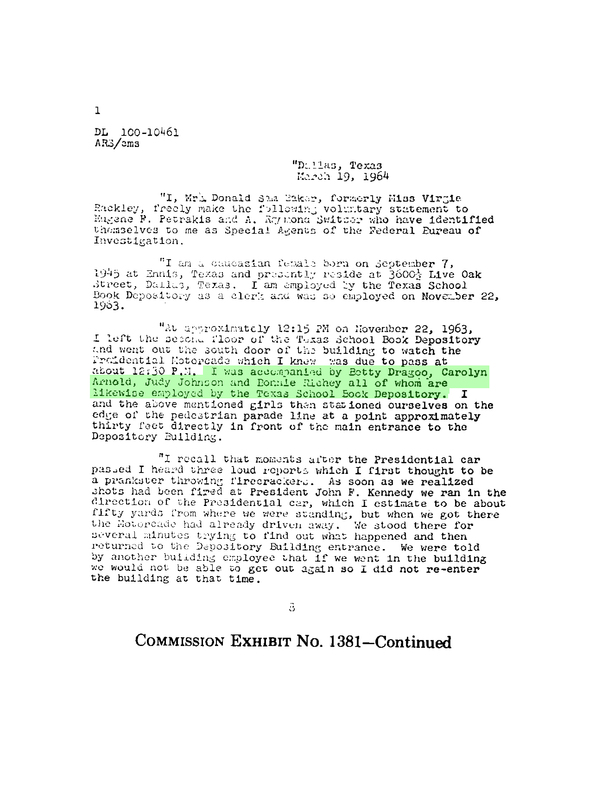 One thing rings clear from Bart's postings and that is she saw Oswald when other people were seen on the sixth. That's conspiracy. I mean I read her account, try to imagine the questions SA Harrison would be asking. That would explain to her how that happened, that she would be able to see him. The image proves she looked back or was 'spun around'. There is no further explanation needed. She said she saw him inside the glass, and then she is caught looking back, documented as LOOKING BACK. Her statements are recorded in a document of the Federal Bureau of Investigation. Her late arriving lunchroom and water trip are not believable in the slightest. She saw Lee, and could corroborate his alibi. This makes the door closing/reflection seen in the Gerda Dunkle GIF important. Lee was a few steps inside that door according to Arnold. Lee claimed to step out to see what the commotion was. He steps to the side as this is only place to stand, and as women are making their way up the stairs ready to reenter the building and door. Thus his location in Wiegman/Darnell out of the way along west wall. Prayer Man is Lee Oswald. Carolyn unknowingly makes it undeniable. Ed. Ledoux wrote: Is she a ditz? I still want to know what got her to do these interviews in such a short time span. Ed was right. 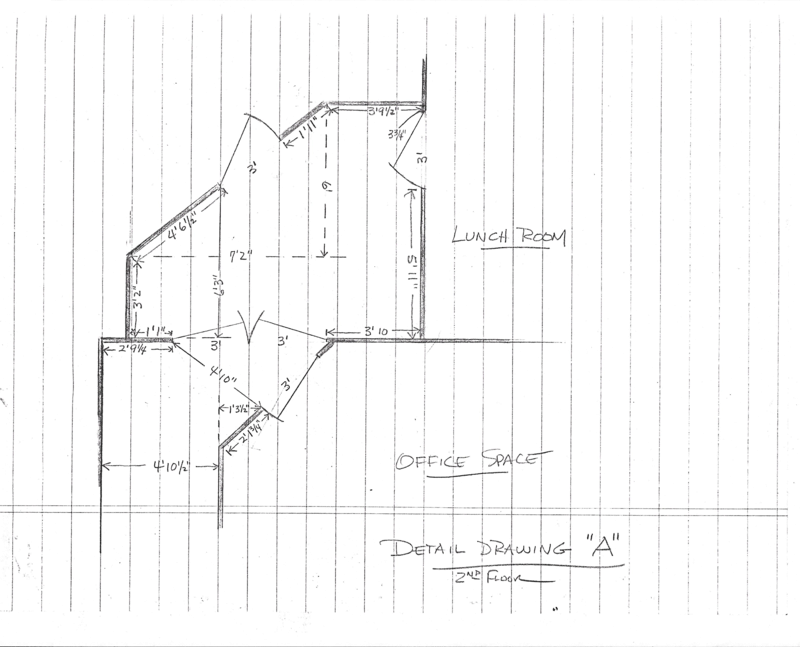 The second floor diagram, from the feds (thx to Gary Murr), , clearly shows the water cooler (and not fountain) in the corridor leading to the front stairs. 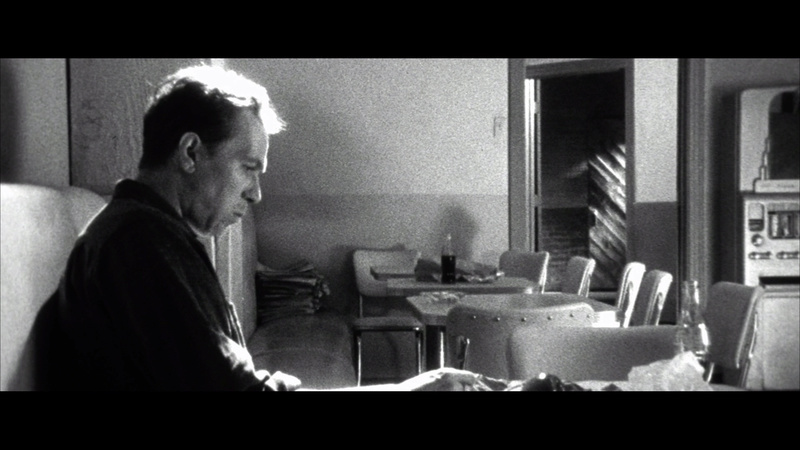 If she took water from that cooler she could NOT have seen Oz sitting in the lunch room, as depicted in the JFK movie. I also need to add that the ladies room is on the bottom left corner, meaning even further way from the lunch room. So she either went to the fountain/water cooler or the ladies to get a glass of water. My money is on the cooler. There is no tap/sink in the 2nd fl lunch room at all. Oh btw... Second floor lunchroom has no water. No way to produce an glass o' water. Carolyn Nearn Arnold would know as much. This is from my forthcoming update on the paper "Anatomy Of The Second Floor Lunch Room Encounter." Carolyn Arnold seen with her head turned towards the Dal Tex building during the shooting in the Wiegman film. Carolyn Arnold seen in Willis 8. ROKC Scan from the Richard Bernabei archive at KIngston UNI. 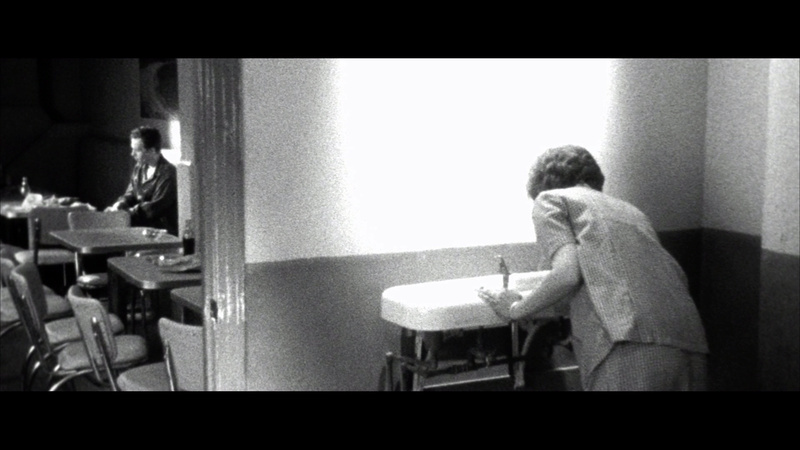 And in the still from the Dan Cook film above it can be clearly determined that she was pregnant at that time. 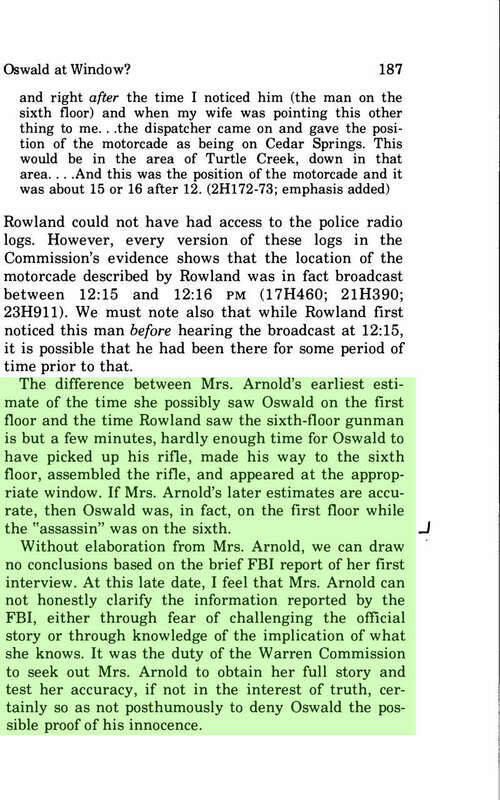 Carolyn Arnold’s statement is interesting because she stated she had left between 12:00 and 12:15 and thought she saw a fleeting glimpse of Lee Oswald standing in the hallway between the front door and the double doors leading to the warehouse, while standing in front of the TSBD. 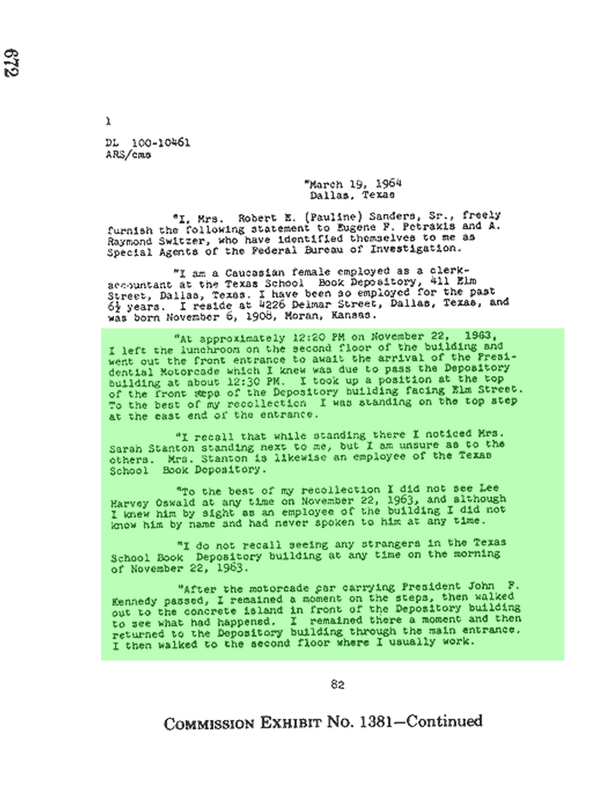 And this statement from the 25th is taken one day after Oswald was killed by Jack Ruby. And from thereon it is all going wrong. The above statement is suppressed, but dug out by Harold Weisberg. And this is widely written about inside his book Photographic Whitewash. 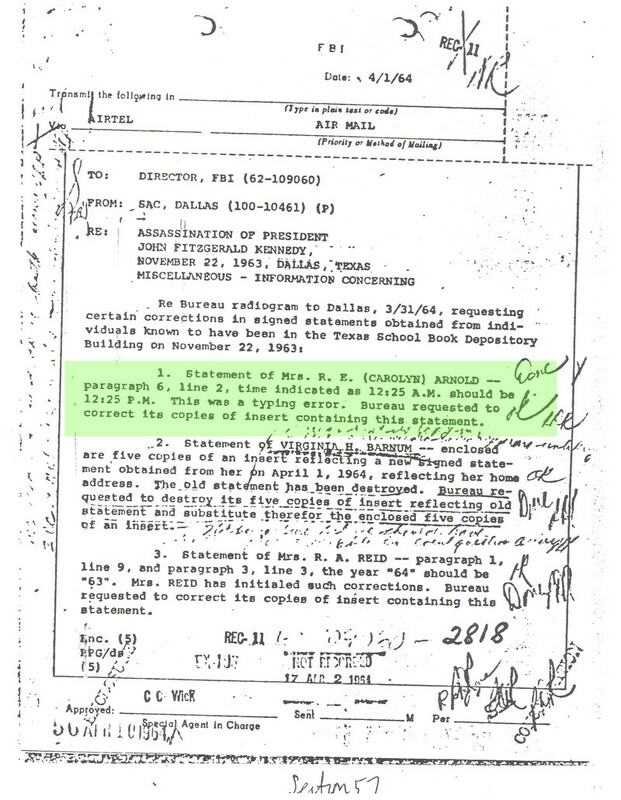 [url=http://jfk.hood.edu/Collection/Weisberg Subject Index Files/A Disk/Arnold Carolyn/Item 08.pdf]Howard Roffman and Weisberg try very hard to obtain the original statement from the FBI, but to no avail[/url]. 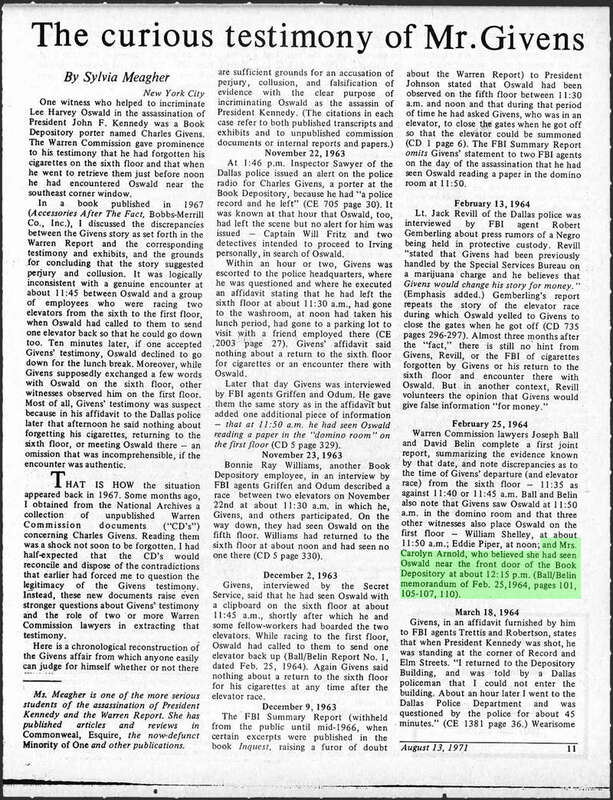 There is some good documentation to read about this at [url=http://jfk.hood.edu/Collection/Weisberg Subject Index Files/A Disk/Arnold Carolyn/Item 08.pdf]Weisberg’s archive[/url]. The timing in the doc below is wrong (it should be PM, and this is noted and corrected). 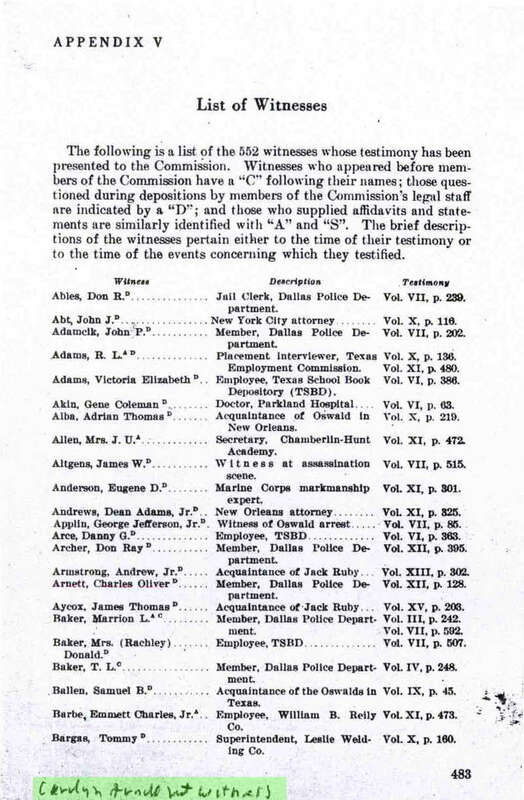 Carolyn Arnold is not called up as a witness for the W.C. either. 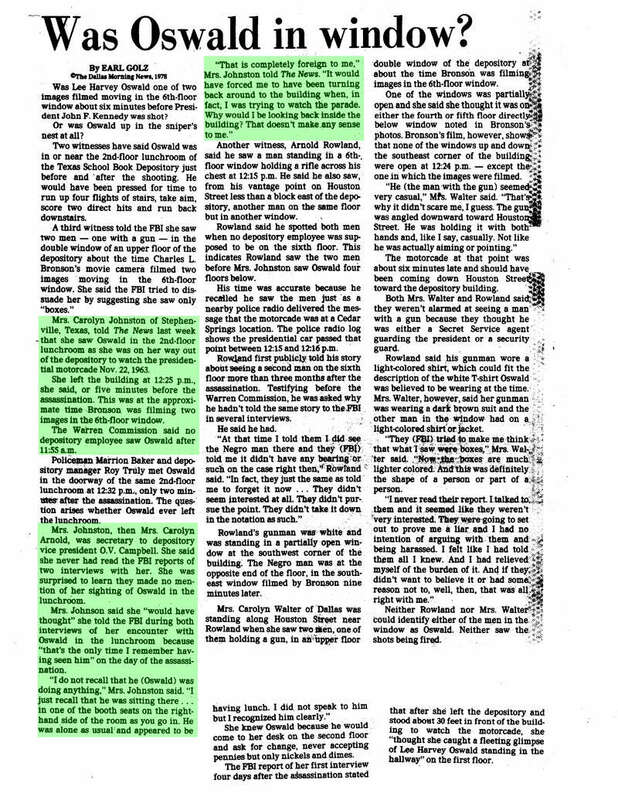 Carolyn Arnold’s (these day known as Carolyn Johnston) interview with Earl Golz in the Dallas Morning News 1978. The highlighted bit in the middle column is interesting in relation to the Wiegman still. As it shows her changing her view towards the Dal Tex building against what everyone else does. 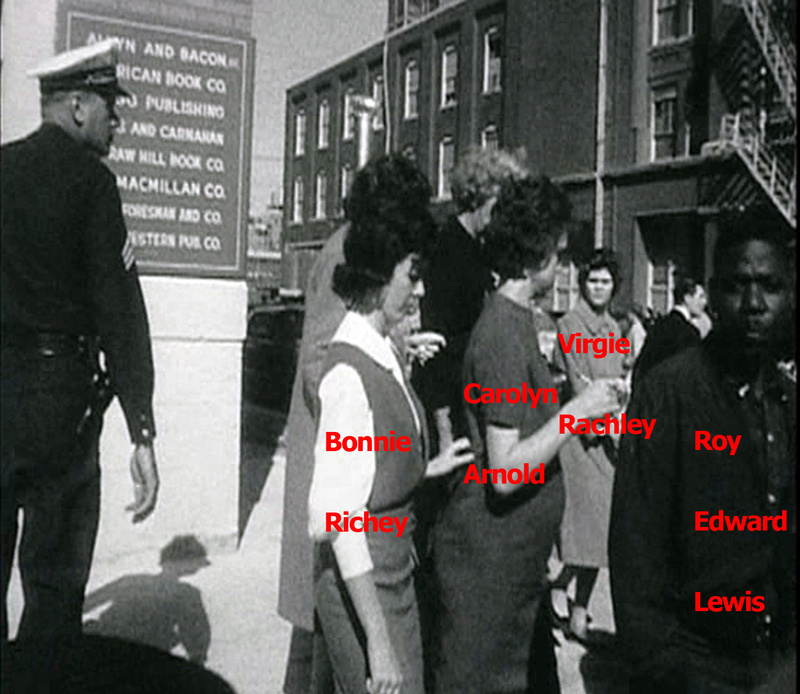 1-according to Virgie Rackley’s FBI statement she left with Carolyn Arnold, Betty Dragoo, Bonnie Richey and Judy Johnson together at about the 12:15 mark. Bonnie Richey confirms this time stamp in her FBI statement. And there is also Pauline Sanders’ FBI statement from March 19th 1964 which states that she left the lunch room at approximately 12:20. Surely she would have seen Oswald? Yet her Nov 24th statement, which I personally regard as a ‘fixed’ statement regarding her hearsay phone call conversation with Mrs. Robert Reid, states she left at 11:25 AM, an hour before the motorcade was expected to pass by the TSBD! This can also be a typo. 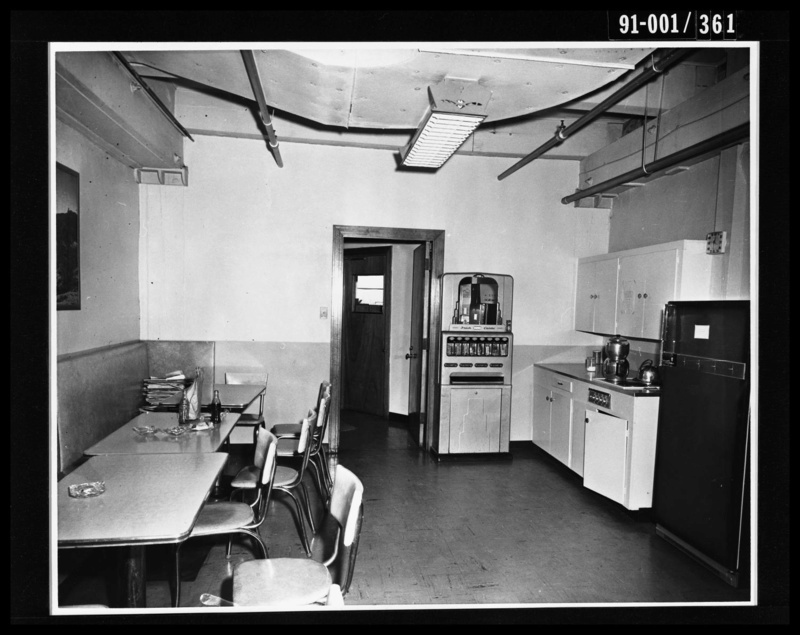 2-The observation brought forward of Oswald sitting down and eating lunch in that particular lunch room. The second floor lunchroom was for office staff and management only. The labourers only had access to this lunch room to grab a drink quickly out of the machine and to get out and eat their lunch outside or downstairs on the first floor in the Domino Room. 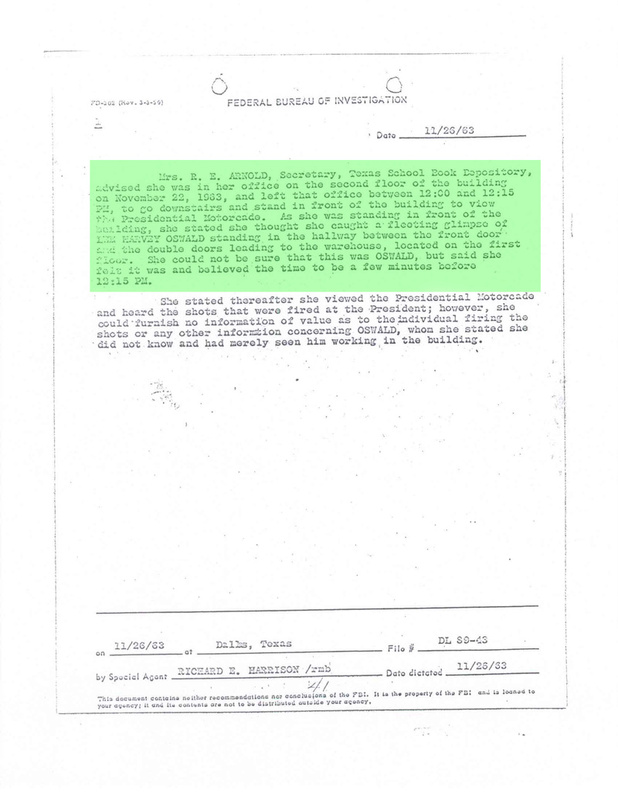 Roy Edward Lewis confirmed this in Larry Sneed’s No More Silence and Billy Lovelady was another one who stated he had gotten a drink for his lunch from that very same lunch room on the second floor and made his way down and eventually consumed his beverage and his lunch on the front steps. There was a class divide at that time, and even these days manual workers sit at a different place away from office- and senior staff. 3-“Getting a glass of water”. Study the photographs of the 2nd floor lunch room on page 70 and see that one cannot just walk to a tap and get themselves a glass of water. Nor is there a water fountain or a water cooler visible. The only option would be jugs or bottles of water. BUT! You can get a glass of water at the water cooler down the hall, as you will be able to see on the F.B.I. drawing on the next page or from the ladies rest room I reckon, although with the water cooler being nearby it would have been more feasible to walk over there IF it happened. Neither water supply is nowhere near the door of the lunch room. As a matter of fact they are way down in the corridor leading to the stairs going down to the first floor. 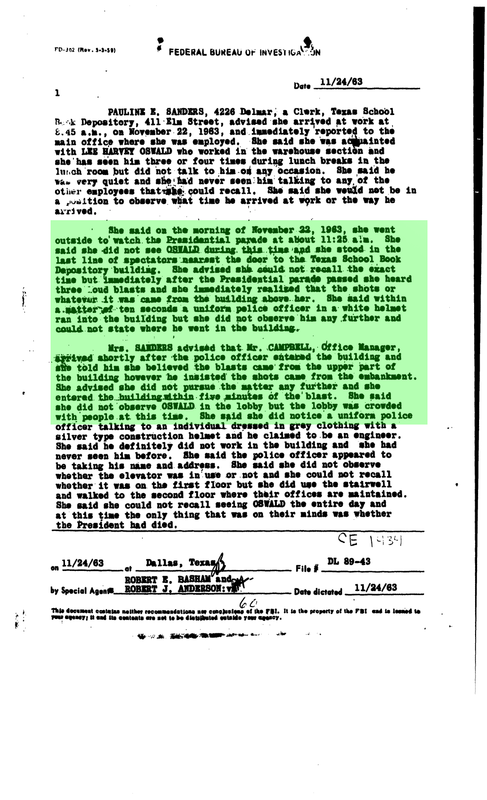 Had she left the office and gone back to get some water it would not have been physically possible to see Oswald sitting inside the 2nd floor lunch room. 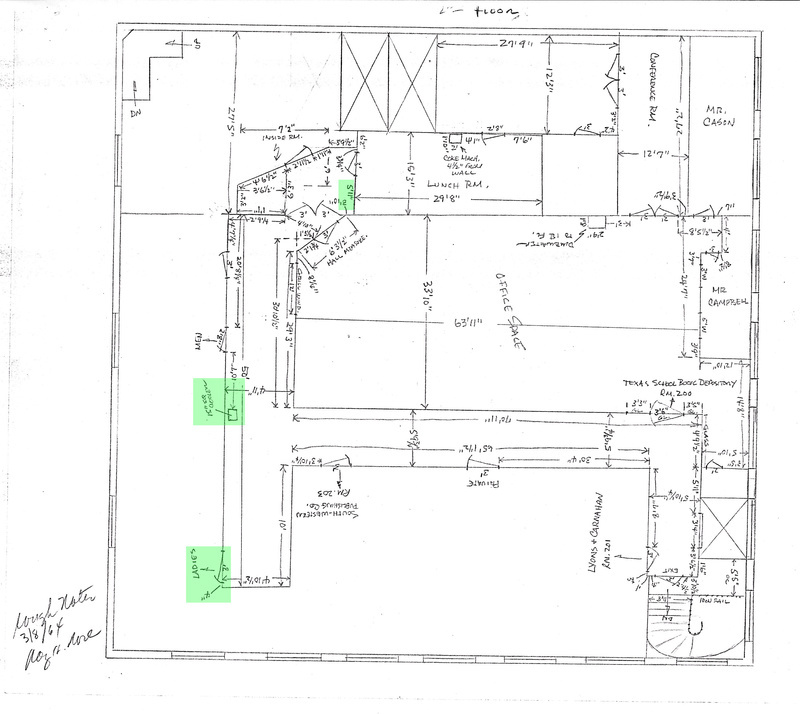 The FBI drawing provided to me by Gary Murr, below, shows in red the non-existent water fountain position in the JFK film, whereas the green marking shows the actual position of it and this makes her observation of Oswald an impossibility. The ladies room can be seen in the very bottom left. 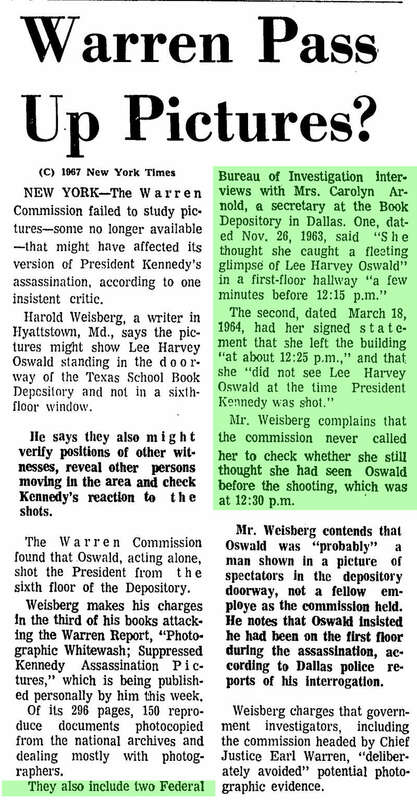 Furthermore if Oswald had been sitting there, other office employees who had lunch before they went downstairs would have noticed and mentioned this as well. Yet no one did. But think also about the timing perspective she mentions. 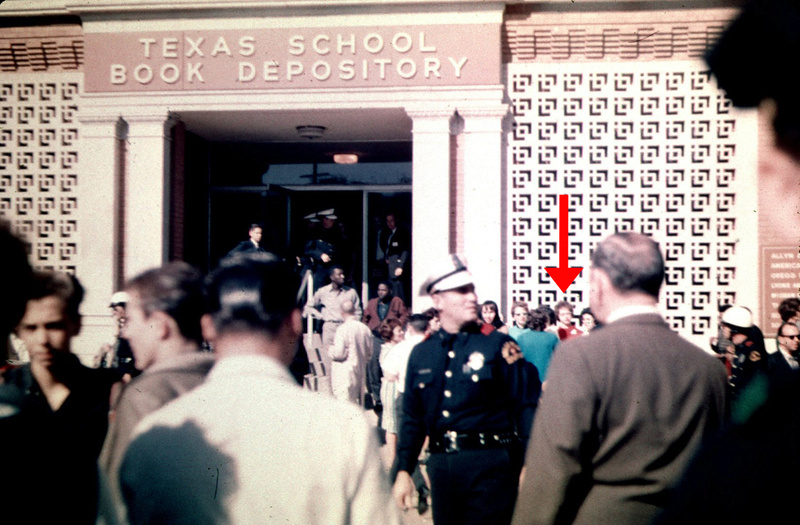 Carolyn Arnold claimed, in 1978, that she saw Oswald in the lunchroom around 12:15. 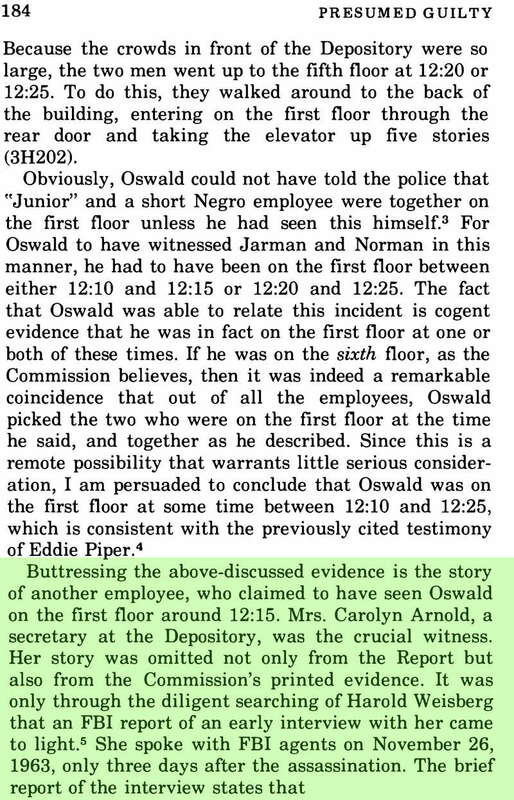 And compare that with the statement of Marrion Baker, who claimed, in 1964, that he saw Oswald walking into the lunchroom around 12:31. 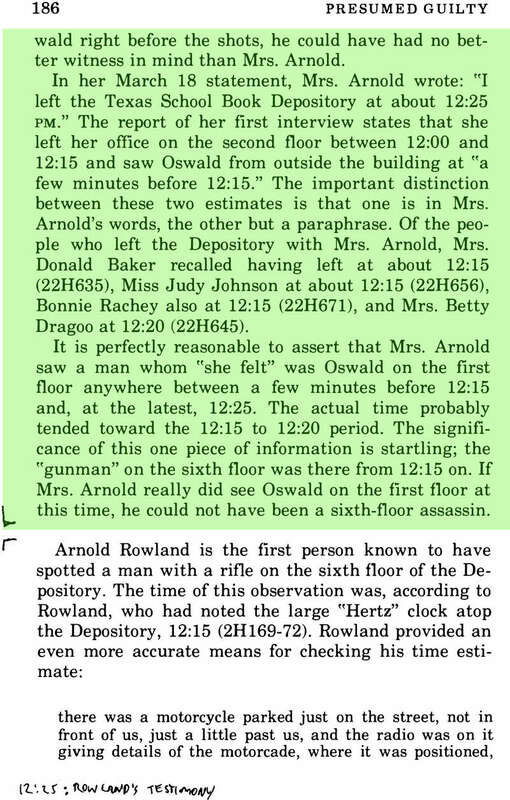 So if you believe her defense of the 12:15 lunch room sighting of Oswald in the lunch room, it creates an issue for Oswald being the shooter as well, as Arnold Rowland saw two persons on the sixth floor in the ‘snipers nest’ at that very same time. 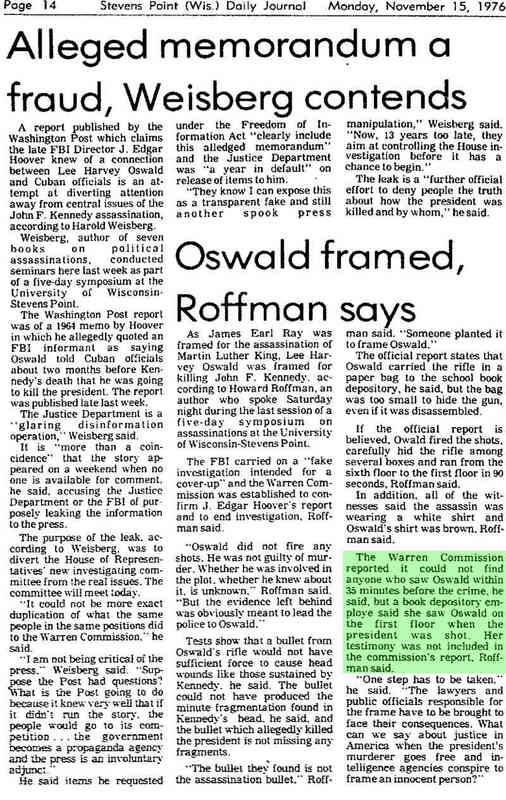 The ‘combination’ of these time stamped two witnesses’ statements would exonerate Oswald as well. Funny thing is that no one picked up on that particular fact until much later. 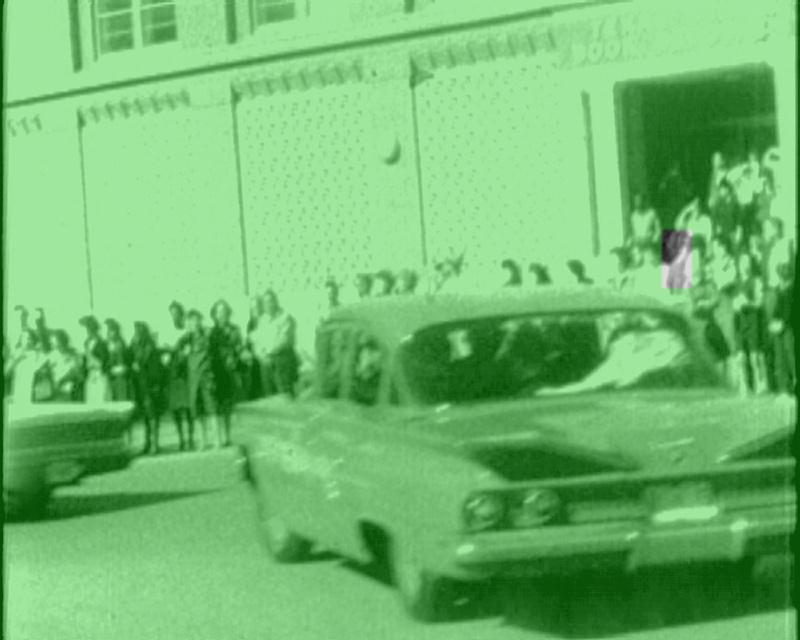 But I still reckon Carolyn Arnold saw Oswald when she turned around when the motorcade was passing. Or just had a look back just before that, nothing unusual about that. And then there is Joe Molina’s statement to B.L. 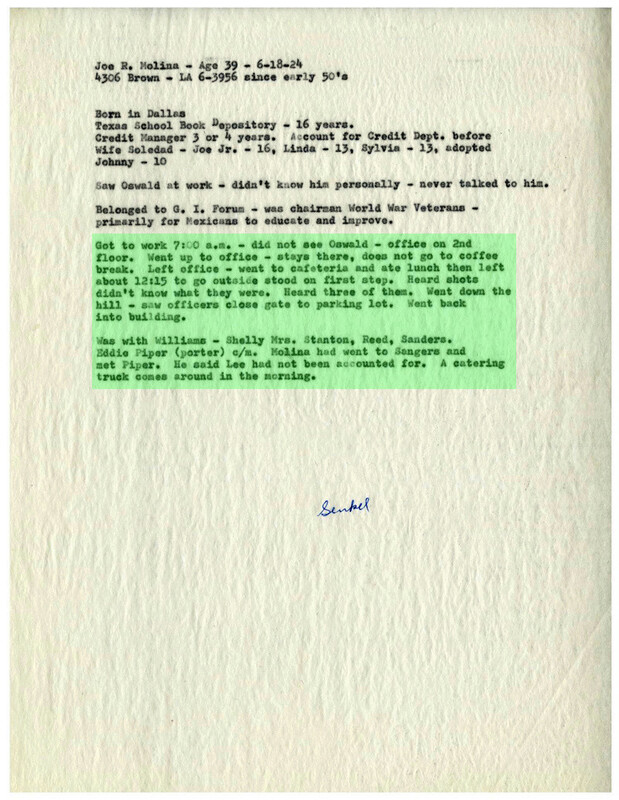 Senkel in which he states that he did not see Oswald and that he left the lunch room at 12:15. Now surely he would have made a mention of Oswald sitting in that lunch room at that time had he seen him. Molina worked on the same floor as Carolyn Arnold. Thanks to Greg and Ed for their input. 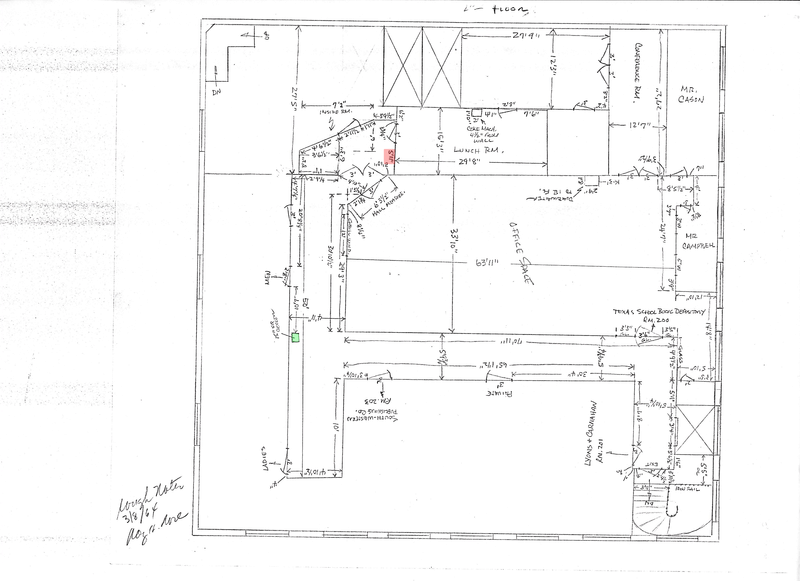 As I glanced over Bart's FBI-Murr diagram of the TSBD second floor, it occurred to me that the layout looked different than in the WC diagram (CE 1118). I cropped the NW portions of each of the diagrams here along with my observations and comments. This Ed, is brilliant my friend. Great thread and really unbelievable stuff by all. This is compelling! Stan Dane wrote: As I glanced over Bart's FBI-Murr diagram of the TSBD second floor, it occurred to me that the layout looked different than in the WC diagram (CE 1118). I cropped the NW portions of each of the diagrams here along with my observations and comments. Well spotted Stan. But I need to add this detailed drawing as well. The thing I noticed was the small space inside that fake vestibule, where Baker was standing inside and Truly leaning in. Truly would have barely been able to see Oswald. That whole position scenario is a complete and utter fake. The detailed drawing looks like the official diagram so this tells me CE 1118 is probably a correct depiction of the layout.